Upon entering our office for your second appointment, you will be greeted by our warm and friendly staff. You will watch a short video discussing what the doctor will go over with you when explaining your results of tests. This will help you to better understand what the doctor will be going over. Expect to be in the office for approximately one hour. 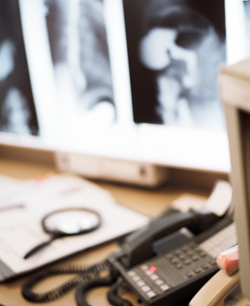 The doctor will explain the results of your tests and review your x-rays in detail with you. Preferably a family member or friend will attend with you, as this aids in the understanding of the results. Once the cause of your condition has been thoroughly been explained to you, you will be given a choice between symptom relief or corrective or wellness care. If you choose corrective care or a CLEAR Scoliosis Treatment Program (Sahara location only), your treatment will be customized for you. It will generally include three (more with scoliosis treatment) distinct steps during each visit. After you and the doctor have decided which course of treatment that is best for you, you can begin your treatment, and be on your way to being pain free and having better health! Take a look to see what you can expect during your regular visits to our office. Please contact our Las Vegas chiropractic office at (702) 256-8686 today to schedule your appointment.